I love working with paper. 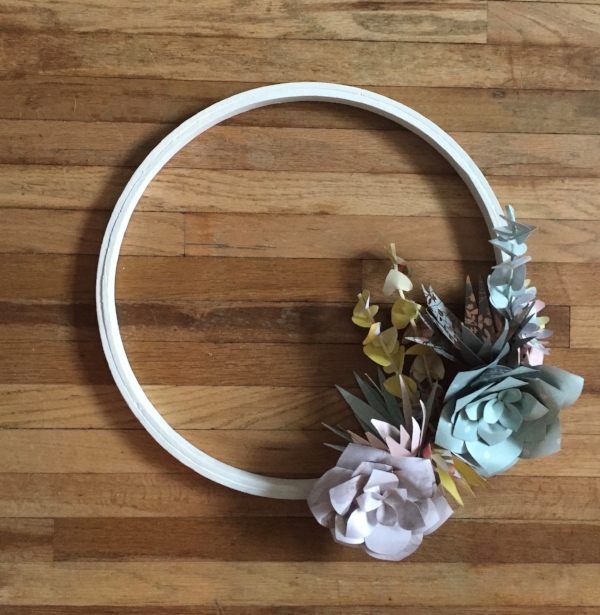 In fact, a couple years ago I made 27 different paper flowers out of newspaper everyday for the month of February - so this was right in my wheelhouse! This time I tried making succulent shapes instead of floral shapes, and I am really happy with the end result. The wreath is fun and cheerful, and makes me feel like we are officially in Spring. Hopefully now we will get some proper spring weather to accompany it. The oversized embroidery hoop I got secondhand from a local thrift store (for $1! ), and the paper and wire is left over from another project - which made this a really easy project for me to get started on. I painted my hoop white, but leaving it natural would look just as good. 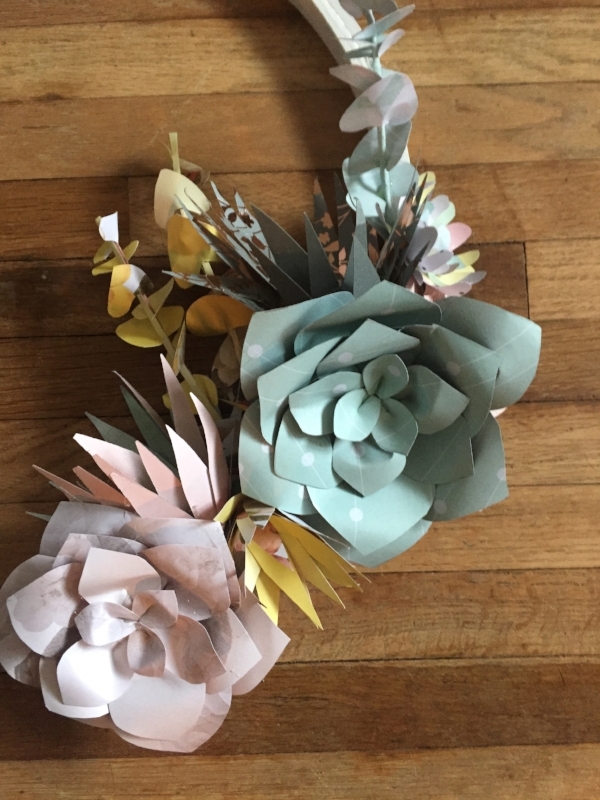 For this paper succulent - I cut 6 of the biggest shape, and 3 of the smaller shapes. You only need one of the disc - it's for the back to secure it all together. Then you curl the pointed edge around a pencil to give it that dimension. This technique is used in one of the other shapes as well - it should leave you with a more dimensional petal. Then you pinch together the flat end, put a small dollop of hot glue there to secure it together, and fix your curled end. Then you just layer them, the biggest to the smallest and glue along the way. 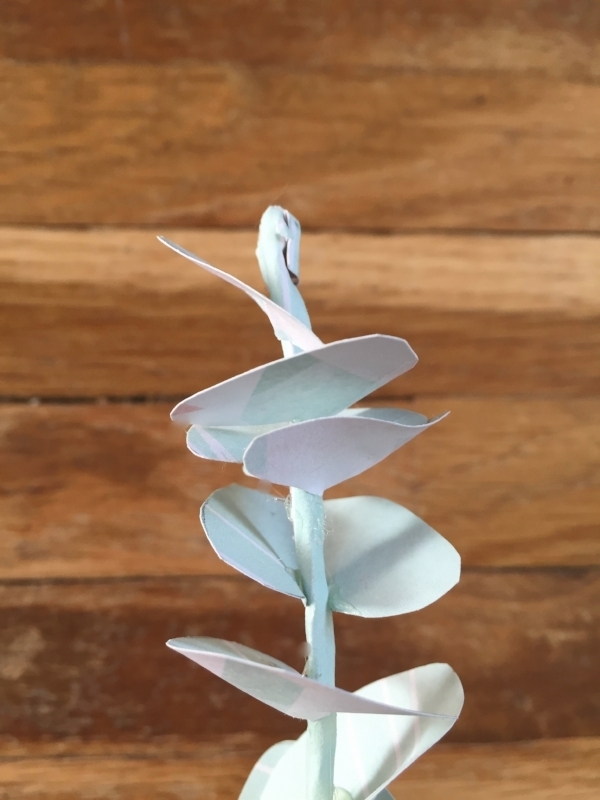 Attach the wire to the back with a good amount of hot glue, and then secure the disc around the entire flower to make sure it all stays together! Hooray! You can make these as big or as small as you'd like - I made my biggest petal about 2 inches long. This one is really easy to construct, the cutting out is the tricky part. I just made up some shapes with 6 petals and went with it! The little squiggle guy at the bottom I used in the very center to give it more of an organic shape. You curl the edges toward the center this time using the same technique with the pencil. I think this one is super versatile and fun - anything goes! Attach the wire and you're done with this guy! This one might be even easier! Cut about 10 strips of paper about 5 inches long, and then cut the ends into points. Then you just layer and glue and layer and glue until you've got something you like! Attach the wire and I like to fold it all toward the center a bit to give it more shape. I pinched the center one slightly to add a teensy bit of interest if you were to look directly into it. The eucalyptus turned out so nicely - I loved this end result. I cut out about 4 of the smaller hearts, and about 5 or the larger hearts. Then you wrap a little bit of paper around the wire, and glue the inside of the hearts to the stem. This is a smidge tricky - you really have to hold it until the glue totally dries to keep it attached. I curled the tip of the wire because I didn't want the wire end to show. That's it! Those are all of the flowers! This whole process took me about 2 movies, (I like to work on the floor in the living room while I watch! ), but you could add or take away any of these and it would still be a simple and stunning wreath! Right in time for Easter - now I feel extra festive.